I totally didn't realize that today is Monday. Labor day has really thrown my weekend thinking off. 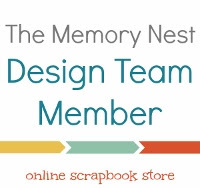 Anyways, here is my layout for the Memory Nest for the make it monday. There is a twist to. You had to use up some old stash. The "&" paper and the orange paper was left over from some kit thing I had gotten once a year or so ago and never really used much of it, because the were 8x8 in size, so it was a good chance to use it up. It's a really funny photo that I wanted to scrap for a long time ago. I never thought I would use "one of those leash things" on my kids, but right as I had turned into a huge waddling pregnant woman my daughter hit the I'm going to do nothing but run away from you phase. That bumble bee backpack became my best friend for a few critical weeks. There is some cute stitching around the clouds that was a pain to do, but ended up as a cute detail. I tried to do some painting thing, but it wasn't exactly what I was going for. Love this page you created for the challenge. Such fun colors!! !